Boots (Choose 1) Notes Buy Warrior Tabi for more power/burst. Build Ninja Tabi for more attack speed and DPS. Late game, you can sell your boots for Elixir of Speed, and buy any item you want to replace it. This is only suggested if you can afford it very late game. Buy the Elixir of Speed after selling your boots before you buy a replacement item. Path 1: Critical Damage Notes Build Asi and The Executioner after boots. Choose either Rage for more critical chance, or Wind Demon for more attack speed. After building one, build Deathbringer last for increased critical damage. Path 2: Burst Damage Notes Choose one lifesteal item between Soul Eater and Bloodforge. If building Soul Eater, build it right after your option for boots. If building Bloodforge, build it last. Choose 2 between Brawler's Beat Stick, Jotunn's Wrath, The Crusher, and Runeforged Hammer. After those, build Titan's Bane to finish off your penetration. Path 3: Tank Shredding Notes Choose between Asi and Bloodforge. Asi is for a quicker lifesteal option, and helps with attack speed and penetration. Bloodforge is to increase the damage your autos do by a lot. If Bloodforge is your choice, build The Executioner, follow the path, and build Bloodforge last. You must build Qin's Sais after The Executioner. After doing so choose either Ichaival for increased DPS as the fight goes on/boxing opportunities, or Odysseus' Bow for the most attack speed and the increased damage that comes from the chain lightning. Relics and Consumables Notes Blink Rune is only an option if you are skilled. I do not advise newer players trying out that tactic until comfortable with the goddess. As time comes and goes, and the earth rotates, the seasons are constant. Summer brings the heat of the sun that shines on us all. Spring blooms the flowers and brings a breeze. Autumn paints the trees and grounds in the colors of harvest. And winter brings the fluffy snow and merry times. However, winter can be harsh. Blizzards that trap citizens in their homes, hail that will bruise the skin and shatter the glass. Sleet covers all in sheets of dastardly white. For the cold is blistering and unforgiving, as it is the absence of everything. The beauty of winter is in its danger. The goddess who controls the cold brings out both sides. A welcoming smile, voice, and clothes that will keep you warm. But just as easily, a heart of cold will turn on you and pierce you. I am IceColdPappsi, and like my name, we will be discussing truly ice cold: Skadi, the Goddess of Winter. A blizzard is upon us! In SMITE, Skadi is a burst hunter. She has tools that help deal lots of Damage Per Second (DPS) with her autos, get in and out of fights, apply CC for single target and multiple enemies, and overall just shred. With easy to learn combos, she can wreak havoc with cold precision. Kaldr is the selling point of Skadi. This passive states that he has a passive and active state. He can only be activated by Rune Of The Hunt. While passive, he will heal his hit points, for a maximum of 5 hit points. Kaldr, while active, loses 1 hit point for each tick of an ability or tower shot that hits him. Minions must deal five hits to Kaldr for him to lose 1 point. If Kaldr is active and he loses all 5 hit points, he will be forced into passive state. 1 hit point takes 7 seconds to heal back, for 35 seconds to regain all points. Lastly, Kaldr moves 110% faster than Skadi, but attacks at half of Skadi's attack speed. This is a line projectile that damages and slows all hit. Kaldr will deal double damage to any enemies affected by this ability's slow. Can go through walls. This is your main clear, as it is able to hit the whole wave. Level it first. This is how you activate Kaldr. You choose a target that he will rush to attack. He will chase the enemy until you get too far away from him. If his target dies, he will attack the nearest enemy. If no nearby enemies, he will return to, becoming passive as he comes back. The healing does not start until he has fully returned to your side. This ability is available at level 0. As you level him, his bites get more powerful and he gains new abilities. At level 1, he gains a dash attack. This dash happens every 5 seconds, and can be doubled by Piercing Cold. At level 3, Kaldr's kills will heal him. He heals for 2 hit points. at level 5, Kaldr's attacks give Skadi 10% more movement speed. Remember that Kaldr's movement speed scales off of Skadi's, so this in turn makes him faster as well. Put one point into it before you reach level 5, than level it last. His bite and dash is based off of your own basic attack damage, so increase your own before increasing his scalings. Be mindful of how you use Kaldr, as he can die rather quickly. Any tick damage on the field renders him useless. Don't send him into a big minion wave by his lonesome. And he can target towers, so use him as a decoy to buy time for the minions to come, and then call him back. This is an Area of Effect that lasts 5 seconds. It deals damage initially to all who enter the area, as well as tick damage for those who stay in the area, 10 times over 5 seconds. Enemies who stay on it will also be slowed, as well lose control of their movement as they slide across the area in the direction they were already going. If Skadi steps into the area, she will gain a movement speed buff that lasts for 3 seconds after she has left the area. The area's radius increases as you level it. This is her unique CC, and there is no other like it in the game. It is also great as a escape mechanic, as you can place it under yourself if being chased, giving yourself a movement speed buff while slowing the enemy. You can alternatively use it as a chase mechanic for Kaldr, by increasing your own movement speed so he can move faster. Upon activation, both Skadi and Kaldr get surrounded by snowstorms that deal tick damage 8 times over 4 seconds. Any enemies hit by its activation will get rooted. The activation also fully heals Kaldr. This can be used as self peel, rooting any enemies chasing you, or as a kill secure for Kaldr. In terms of tower damage, you can use the earlier tip of using Kaldr on towers, and when he has 1 point left, activate this ability to restore him to full, if you find that you can safely secure the tower. The same can be done on jungle bosses. Note: have all abilities on Quick Cast, except for Winter's Grasp, which should be on Instant Cast. This is your main combo. You can use this to clear in the early levels. It is also used for poking your enemy hunter. Start with Permafrost to slow them and have them slide in a direction. While they are sliding, hit them with the Piercing Cold to slow them even more. After that, basic attack them if you are in range. This is meant for quick poke to apply pressure, not to kill yet. This is when you start to get Kaldr into the equation. Start by selecting your target for Kaldr, and before Kaldr reaches them, use Piercing Cold to apply damage, slow, and the doubling effect. At that point, Kaldr will have already hit them with a dash, so use Permafrost to have them slowed even more and sliding across the lane, to which you can get in range for basic attacks. You can also use the Permafrost movement speed buff to boost yourself and Kaldr, and go in for the kill, or at the least, they will use either Purification Beads or Aegis Amulet to escape death. Alright, time to put them 6 feet under. Target someone for Kaldr to attack, moving with him so you can get in range for your other abilities and basics. As soon as Kaldr reaches them, press 4 to activate Winter's Grasp and its root. Once they are rooted, you could either basic them until the root is over, or use Piercing Cold to slow them, making your basics and Kaldr hit even harder. Once the root is over, use Permafrost while they are running away so their escape is rendered futile. That is, if they don't die during the root. You are immobile, you will get chased. If you are, use a Permafrost under yourself to give yourself a movement speed buff while they are slow and sliding. Once they get back on you, use your Winter's Grasp to root them in place. And dodge in unexpected patterns. 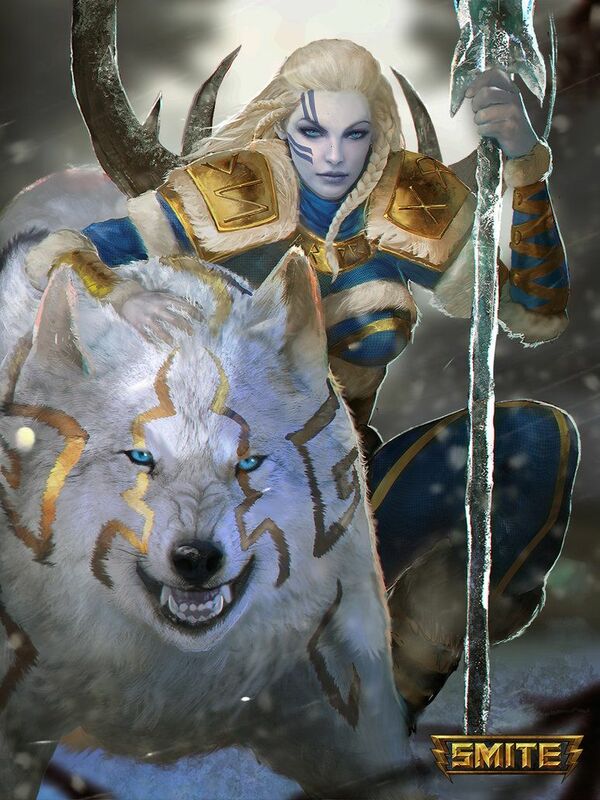 As part of Skadi' god design, she is depicted holding an ice spear with a sharp tip. Alongside that is Piercing Cold, which is another spear with even more tips coming out of it? But these next few blades and tips will make your basic attacks, or abilities, even colder. This is your core item. It provides power, mana, cooldown, and MP5. Each stack, which you can gain 1 from killing minions or 5 for killing gods, gives you 15 mana. The item evolves at 50 stacks, for a maximum of 750 mana from stacks and 1050 from the item as a whole. When it does evolve, 3% of your maximum mana is turned to power. From this item alone, you will gain 31.5 power from the stacks and 35 power upon purchase, for 66.5 physical power, which is only rivaled by Devourer's Gauntlet, another stacking item that gives 65 power total, and Bloodforge, which gives the most physical power at 75. Transcendence is essential to Skadi, as her abilities, including Kaldr, benefit greatly from this item. Your choice of blessing comes down to either your opinion of Skadi as a hunter, how you play hunters, or what kind of build you want to utilize. If you think of Skadi as an ability hunter, and plan to build some penetration, as her burst damage is her bread and butter, then Mage's Blessing is for you. It gives power, mp5 that increases as your mana decreases, and extra damage on your abilities. Once evolved, it will give cooldown reduction, helping with your burst potential as your abilities will come off cooldown faster. To compliment your abilities, you will need more power, and Warrior Tabi gives the most power, helping you to deal the most damage you can. If you think of Skadi as a carry hunter, and want more attack speed in your build, as most of your damage will come from your autos, then Hunter's Blessing is for you. It gives a flat MP5, along with extra damage on your basic attacks. When evolved, it gives extra attack speed, to increase your DPS even more, as you can send autos out faster. On the point of DPS, Ninja Tabi gives some power, but a lot of attack speed, to help fire off even more basics. In the late game, you can be able to sell your boots for Elixir of Speed, allowing you a new item. What you choose to build here is up to you, but I suggest an item that corresponds to your build path. If wanting some defense, Magi's Cloak may help, as it provides health, protections of both kinds, and a second of CC immunity every 70 seconds. Your core items, lest we forget that Skadi is an ADC. Asi recent rework gives you power, penetration, attack speed, and physical lifesteal. Additionally, when you reach at or below 35% of your maximum health, you will gain 30% extra lifesteal, for a total of 50% physical lifesteal. This means that you will heal for half the damage of your auto attacks on any given enemy. This is a great boxing tool, and can be considered a comeback mechanic, as that much lifesteal could mean 100-200 health recovered on each auto. The Executioner builds from the same tree, giving power and attack speed. Its penetration is applied after every basic, decreasing the enemy's physical protections by 12% of their maximum, for a total of 36%, for 3 seconds. This easily helps put even more damage numbers up, and can apply to jungle bosses. This will be your option for critical damage, if you choose to go down this path. You will choose between Wind Demon and Rage, both of which fit different types of playstyles. After choosing one, you will build Deathbringer and complete your build. As a note for those who don't know, a critical hit deals twice as much damage than a regular auto attack. Wind Demon is a great item to keep the momentum going. It gives power, critical chance, and attack speed. After every critical hit, your attack speed and movement speed is increased. This is great for increasing your DPS momentarily, or for long periods of time if you are able to consistently hit critical hits. This also applies to jungle bosses, where these extra stats prove the most helpful. Rage gives just power and critical chance. After gaining an assist or kill on enemy gods, you gain 2% extra crit chance, for a maximum of 10%. In total this item gives 40% crit chance, which can help tons in terms of crit chance and overall damage dealt. Deathbringer is the icing on the critical cake. Power and crit chance, along with an extra 30% damage to your critical hits, making the multiplier 2.3*your regular auto attack damage. Considering the power it gives, along with the power you will already have with this build, and the attack speed this sort of build gives you, the 30% is deadly. In your burst build, you will still need lifesteal. Both of them are great for completing the task at hand, but the one you choose is dependent on how much faith you put in your abilities. Soul Eater has climbed the burst meta, and has become a staple lifesteal item even amongst solo laners. Providing power, lifesteal, mana, and cooldown reduction. For every nearby death of a minion or jungle camp, you gain 1 stack, while gods and jungle bosses are worth 5 stacks. After 75 stacks, Soul Eater evolves, giving you 20 more physical power, for a total of 60, and 15% lifesteal on your ability damage. Seeing as this burst build will have you dealing hundreds of damage on multiple enemies at a time, this can do wonders in sustain. Bloodforge is pure power and sustain. However, it provides the most power in the game. Additionally, after every kill, you gain a shield with a maximum health of 400, along with a 10% movement speed, for 20 seconds. This is crucial in the long game, as 400 health is like a hot knife through butter, so having that extra bit of health can save your life. The movement speed is really just the caveat of this item, as it allows you keep pushing for kills, or to get away safely. If you choose this item, build it last in the build. That's a Lot of Damage! These are your burst items, meant to increase the damage your abilities do. You will be choosing two of the listed below, if you go down this path. Brawler's Beat Stick is the most popular and effective anti-heal item physical damage dealers get. Power and pen. It reduces the healing of enemies hit by your abilities by 40% for 8 seconds. This includes all forms of gaining health, not just ability healing. It's obvious that you would get this to counter any healers the enemy team has, but less health regeneration is always a bad thing, making this a good item to have in any situation. Jotunn's Wrath is overall a great item. Power, pen, mana, and cooldown reduction. Just pure stats, so it's up to you to make the most of it. The cooldown can help you fire off more abilities, and the mana is good for two more abilities than usual. The Crusher gives a great balance between DPS and burst. Power, pen, and attack speed. When you hit an enemy with an ability, you will deal two moderate amounts of damage on top of that, as stated by this item's passive. This helps the best to kill chasing enemies, and clearing waves. The extra damage scales off of your physical power, so having this item in a burst build ensures that your combos will kill. Runeforged Hammer saw a buff recently, turning this off meta warrior's item into a hunter burst commodity. Giving health and power, enemies under CC, not including blinds, grabs, or knockups, take 15% more damage all of your sources. Each of your abilities, except Rune Of The Hunt, apply a CC, so land one, and all of your basics, other abilities, and even Kaldr bites, will deal more damage. This is what brings your penetration and burst full circle. Titan's Bane gives just some power, and a good amount at that. All damage you deal, including Kaldr, will ignore 15% of the target's physical protections. If they have more than 65 physical protections, it will scale up, capping at 40% of your opponent's protections ignored if they have 200 or more. Late game, enemies will have close to 40-50 physical protections naturally, so one physical defense item in their builds, and Titan's Bane has become that much more effective. The final path you can choose, and probably the one you may take sooner than later, what with the currently shifting Season 6 meta. In this one, choose between Asi and Bloodforge for your lifesteal. I have went over them in detail previously, so base your decision off of whether you want more attack speed or power to factor into your DPS. Build Qin's Sais after The Executioner, then choose either Ichaival or Odysseus' Bow. Qin's Sais is necessary. Power and attack speed. Every basic attack that hits an enemy deals extra damage equal to 3% of their maximum health. The more health they have, the more of their health will be dealt as extra damage, capping at 5% maximum health damage for 2750 maximum health. This is considered true damage, so it bypasses protections, but can be reduced by mitigation. Ichaival is more of a boxing tool, but provides more attack speed than Qin's Sais. It also provides power upon purchase, and with every successful basic attack, for a maximum of 45 extra power after 3 autos. The icing on the cake, or the boxing potential, is that it also reduces your opponent's attack speed by a maximum of 30%, which can work especially good against auto attacking warriors. Odysseus' Bow is pure attack speed, providing the most in the game. Every fourth basic attack spawns a chain lightning that scales off of your power. This is good to use the tank as a damage web to their other teammates, and helps to push more autos out, which is your main damage source. So we've gone over Skadi extensively. You've armed yourself with the intricacies of her kit and how to effectively build her. Now it's time to actually play her! An ADC, or Attack Damage Carry, is meant to deal consistent damage and secure kills on enemies and objectives, usually having lots of protection around them to make sure they do not die. This section will help you do just that. Walls of text incoming. Purple Buff is for the support, and reduces protections of enemies by both a flat and percentage amount. This is the most common buff for the duo lane to go for, and the enemy team will try to steal it from you. Go for this is soon as you can, as it gives great early pressure. In the early stages, the jungler will also want to gank the enemy ADC to shutdown any carry potential they may have over you. They will usually call for a gank, and start to go into their jungle, looking to flank them. If you spot, signal to your support, and push forward, putting the enemy in a position to fight. Let the support initiate, and you follow up, so the jungler can pick out their target and go in for the kill. Chase the kill if possible, but not too far, as the enemy jungler could just as well gank your lane and catch you out of position, as your support and jungler will not be able to protect you. At some point, your support will have left you to rotate to other lanes and gain some assists. This means it's just you and the enemy ADC. Focus all you can on farming and gaining more gold and xp than the other hunter. Still be mindful if the enemy leaves lane, follow their path. You can also choose to gank the mid lane, but only if the jungler calls for it aloud. Don't forget that you can still get ganked, so ward up when you can, or just play safe. The time for farming has ended. You have gained sufficient stacks, and it's time to start being a team member. You can still stay in lane if you so choose, and be a split pusher. This is when you decide to get a tower kill over helping the team in a fight. In some situations, it proves a good strategy if you can all the way to the phoenix, and your team is able to hold themselves well enough without their ADC. If they are obviously dying while you are rackin up numbers on the tower, then stop doing that. And as always, ward behind you, because you will get ganked while split-pushing. If being a team member, you are to stay to the back of the team, just out of range of your own basics, so you are not tempted to attack without purpose. After most fights, if most of your team is still standing and theirs isn't, it is time to push for meaningful objectives. Towers are the most obvious, as they help weaken that lane's defenses, and are always good to capture. Gold Fury still just gives gold, but it's a hefty amount, so be aware. Oni Fury gives your minions a speed and damage boost for the next two waves across all lanes. This is arguably the better version of the two new ones, as these minion waves are fully capable of securing towers by themselves. This is marked by a red Gold Fury insignia. As you are an ADC, and your build is looking close to halfway, your damage is needed in these objective secures, just as much as they are needed in kill secures. It's the home stretch of the game. Your build is almost complete, and your team has been performing rather well. That does not mean you can slack on your duties: Stay positioned in a defensive manner as not to get picked out by the enemy at all, apply consistent damage for kill and objective secures, and ward as you can. Now both teams have their eyes on the Fire Giant, definitely the most valuable buff in the game. Health and mana regen, increased power and damage against objectives. For your team, it ensures a crushing victory. For the enemy team, it is hope shining towards a comeback. There should be at least a sentry ward in the Fire Giant pit, along with two regular wards in the crevices of the enemy jungle leading to the area, to telegraph enemy movement. In these moments, all it takes is one huge teamfight to sway the whole game. And so, the snow melts. I am a Skadi main, so it was a breath of fresh air making this guide. I also love the winter time, which is even better. I hope you find fun in Skadi, as she is the most unique hunter by a long shot. I mean Kaldr is best doggo in SMITE. I would like to thank Branmuffin17 for help with the items in game, Gulfwulf for the comments, and Zilby for the template. This has been IceColdPappsi, and ****, brain freeze. In your trans example crit build why not swap Wind demon for rage, and then have wind demon as a boots replacement? 2 item crit builds without rage are meh, and we sometimes see builds that only have 1 crit item where that item is Rage (which I would recommend on Jing Wei due to the 2, build rage, then build the rest like attack speed qins build, e.g. Devs, boots, rage, exe, qins, asi, sell boots for titans bane ). Also since this is ADC role I would prefer hunters to mage's on Skadi since her damaging abilities have long cooldowns, (and also because she can't one shot someone like Ullr in a combo, or has 3 damaging abilities like Neith). Also Heartseeker and blackthorn I feel are be viable on Skadi, especially heartseeker. (of course in an ability based build that has transcendence). 142607 Kriega1 In your trans example crit build why not swap Wind demon for rage, and then have wind demon as a boots replacement? 2 item crit builds without rage are meh, and we sometimes see builds that only have 1 crit item where that item is Rage (which I would recommend on Jing Wei due to the 2, build rage, then build the rest like attack speed qins build, e.g. Devs, boots, rage, exe, qins, asi, sell boots for titans bane ). Also since this is ADC role I would prefer hunters to mage's on Skadi since her damaging abilities have long cooldowns, (and also because she can't one shot someone like Ullr in a combo, or has 3 damaging abilities like Neith). Also Heartseeker and blackthorn I feel are be viable on Skadi, especially heartseeker. (of course in an ability based build that has transcendence). Why put points into Skadi's ult throughout the match? Better to just level it late. Especially considering the current state of her ult. 142483 Kriega1 Why put points into Skadi's ult throughout the match? Better to just level it late. Especially considering the current state of her ult. It was partially deserved, she was kinda top tier when they made that change. (she was also pretty broken in duel). But they also nerfed other parts of the kit which was overboard. 142604 Kriega1 It was partially deserved, she was kinda top tier when they made that change. (she was also pretty broken in duel). But they also nerfed other parts of the kit which was overboard. Hmmm...no offense Papps, but I think I'm with Kriega on this one. I mean, you have a point on the root duration, but it's minor enough that putting a point into it is only partially beneficial. If it was 0.25 seconds on a regular ability with a significantly lower CD, like Confound, it's more understandable. And sure, the damage increases, but it's not like it's a huge damage upgrade with each level. Instead, after prioritizing Piercing Cold for the wave clear, you've got 2 other abilities that provide multiple benefits upon leveling. Rune Of The Hunt might not be one I really prioritize that much, but Permafrost not only has a normal ability CD, but also provides increased damage, a larger radius, and faster MS boost. I'd think that would probably be a larger priority than the ult. Just things to think about. 142543 Branmuffin17 Hmmm...no offense Papps, but I think I'm with Kriega on this one. I mean, you have a point on the root duration, but it's minor enough that putting a point into it is only partially beneficial. If it was 0.25 seconds on a [i]regular[/i] ability with a significantly lower CD, like [[Confound]], it's more understandable. And sure, the damage increases, but it's not like it's a huge damage upgrade with each level. Instead, after prioritizing [[Piercing Cold]] for the wave clear, you've got 2 other abilities that provide multiple benefits upon leveling. [[Rune of the Hunt]] might not be one I really prioritize that much, but [[Permafrost]] not only has a normal ability CD, but also provides increased damage, a larger radius, and faster MS boost. I'd think that would probably be a larger priority than the ult. Just things to think about. It's gonna take some time for me to go through all of this writeup, but some quick things I've noticed. Ichaival is listed in the tank shredder build. Ich is more for boxing and countering other basic attackers...like a Baka or the enemy ADC. And in your writeup of Ich, you say it can work especially good against auto attacking warriors. Not just them dude, also AA junglers (e.g. Kali / Baka / Ao Kuang) and of course enemy ADCs. I'd think a tank shredder build (when really focusing on killing tanks or tanky comps) would probably consider adding in Titan's Bane (in addition to Exe and Qin's). Also, not sure if BF would be better than Asi or not, because Asi provides higher LS, some added pen, and more AS to further empower Qin's. Your writeup on Qin's in "Path #3: Tank-Shredding" is incorrect. You state Qin's passive bonus damage "is considered true damage, so it bypasses protections, but can be reduced by mitigation." It counts as physical damage, not true, and it states so in the item description. Hard to say, but I'm not sure I'd lump Runeforged Hammer with the burst damage items. It can be used in a basic attack build as well, with other normal basic attack items. The builds the pros are using right now are really weird though. In the early game, if you're looking to help the jungler, you might not want to push the enemy back. Instead, you might want to feign weakness and/or clear wave more slowly. The closer they are to your tower, the longer they have until they're safe. Also, your support may leave, and maybe the enemy one doesn't, and you have to play safer and near your tower. Maybe your enemy ADC leaves, and instead of just following, you farm up and just warn the mid-lane...and you don't just follow their path, what are you thinking??? And after your first or second back, you should be warding your own area. Mid-game, Fire Giant is definitely a targeted objective. But unlike Pyro and GF, it needs a concerted team effort and as little threat of contest as possible...so if an early teamfight is won and you've gotten some kills, you can absolutely go for it together. Sentry Wards are definitely something to consider, not just in the "time to end" phase. You're fine changing anything now. It won't disqualify, it just won't be taken into account. 141647 Branmuffin17 You're fine changing anything now. It won't disqualify, it just won't be taken into account. Okay thank you. I also have to add a matchups section. 141672 IceColdPappsi Okay thank you. I also have to add a matchups section. And it shows: she's 3-3 and only went positive in kills versus deaths twice. 141503 Gulfwulf And it shows: she's 3-3 and only went positive in kills versus deaths twice. Yeah Skadi is a very niche passive, I don't see the use of it tho. 141337 IceColdPappsi Yeah [[Skadi]] is a very niche passive, I don't see the use of it tho. It's really rare see it in the game. 141339 xmysterionz It's really rare see it in the game. Have you seen his god reveal? Sounds promising. My favorite are "Many forms of Ratatoskr" and "Bee Movie 2"
His "The Road to Diamond Nike" video is the reason I'm still alive. That video gives me life. 141332 Vini_sds His "The Road to Diamond Nike" video is the reason I'm still alive. That video gives me life. True. I felt the same way with those videos I mentioned before. 141334 xmysterionz True. I felt the same way with those videos I mentioned before. Drop Soul Eater from your burst build and get Asi instead; replace it late with Bloodforge. Also, The Crusher should be built right after boots: Transcendence, Warrior Tabi (finish these before trans), The Crusher, Asi, Jotunn's Wrath, Titan's Bane, Bloodforge. If you sell your boots, grab either Magi's Cloak or Mantle of Discord if you need protections or get Runeforged Hammer. You can also swap rune with Asi if you like. For your crit build, get Wind Demon/ Poisoned Star before The Executioner and build Devourer's Gauntlet instead of trans. You can also drop Asi for crusher and replace it with either Ichaival or Odysseus' Bow late. Crit should also have warrior tabi and not Ninja Tabi. I generally don't recommend crits on Skadi since she doesn't have a steroid, but she can use them. I'd go for either an ability build or one with Qin's Sais and attack speed. Tank shred is fine though I'd probably go Asi instead of bloodforge for the extra attack speed since Skadi doesn't have any steroids. Just watch out for tanks building Hide of the Nemean Lion because you can kill yourself trying to kill them. Don't even mention Blink Rune; it's okay for a jungler, but an ADC shouldn't be building it because Purification Beads and Aegis Amulet provide better function. 141308 Gulfwulf Drop [[soul eater]] from your burst build and get [[asi]] instead; replace it late with [[bloodforge]]. Also, [[the crusher]] should be built right after boots: [[transcendence]], [[warrior tabi]] (finish these before trans), [[the crusher]], [[Asi]], [[jotunn's wrath]], [[titan's bane]], [[bloodforge]]. If you sell your boots, grab either [[magi's cloak]] or [[mantle of discord]] if you need protections or get [[runeforged hammer]]. You can also swap rune with Asi if you like. For your crit build, get [[wind demon]]/[[poisoned star]] before [[the executioner]] and build [[devourer's gauntlet]] instead of trans. You can also drop Asi for crusher and replace it with either [[ichaival]] or [[Odysseus' bow]] late. Crit should also have warrior tabi and not [[ninja tabi]]. I generally don't recommend crits on Skadi since she doesn't have a steroid, but she can use them. I'd go for either an ability build or one with [[qin's sais]] and attack speed. Tank shred is fine though I'd probably go Asi instead of bloodforge for the extra attack speed since [[Skadi]] doesn't have any steroids. Just watch out for tanks building [[hide of the nemean lion]] because you can kill yourself trying to kill them. Don't even mention [[blink rune]]; it's okay for a jungler, but an ADC shouldn't be building it because [[purification beads]] and [[aegis amulet]] provide better function. It may seem like I'm nitpicking, Pappsi, but this is definitely one of your better guides. I'm reserving my vote until I see some changes. In regards to Bran's comment below: I've tried soul on Skadi in arena and wasn't impressed. Nobody has picked it up in ranked conquest since 2017, so I'd be perfectly fine with just dropping it all-together; though some testing would need to be done to determine if it's viable or not. 141310 Gulfwulf It may seem like I'm nitpicking, Pappsi, but this is definitely one of your better guides. I'm reserving my vote until I see some changes. In regards to Bran's comment below: I've tried soul on Skadi in arena and wasn't impressed. Nobody has picked it up in [url=https://smiteprobuilds.com/Builds?p_filters_page=1&p_filters_search=&p_filters_god=2107&p_filters_pro=~&p_filters_opponent=~&p_filters_role=Carry&p_filters_league=Ranked:Conquest&p_filters_sort=~]ranked conquest since 2017[/url], so I'd be perfectly fine with just dropping it all-together; though some testing would need to be done to determine if it's viable or not. Gulf, I would personally suggest keeping options open. If you look at the builds in your link, they're all over the place. Void Shield built 3rd, followed by Runeforged Hammer. Starting Rune, getting Trans 3rd, followed by O-Bow 4th. And then you look at other builds for other gods like Cern, and they're also all over the place. You dismissing Soul Eater because you didn't like it in Arena is honestly not a good reason, especially when considering it for a mode like Conquest. Arena, you don't need lifesteal nearly as much, as you know. In a longer mode, and when going Trans, your first option for lifesteal is going to be 3rd item after Boots. Typically we say not to get BF until late due to the price. Asi got a very nice buff, and the AS is great for that hybrid function, but the stats on SE aren't bad at all, depending on what you're looking for. If combining with Trans, the CDR from both is very nice, especially for a god that has pretty long CDs. The power is also pretty good, and it doesn't take long to stack. Again, if anything, it is probably niche and off-meta like I said, but just dismissing it, don't agree. The Crusher doesn't have to be built right after boots. It can be completely skipped at this point if you really want, due to the emergence of Asi and Ichaival. But if you DO get it, I agree with the build position. Crit should NOT specifically have Warrior over Ninja, dude. Skadi has no steroid. As an FYI, building Devo's, Ninja, Exe, WD, DB, and Ichaival, Ninja gives 25-30 higher DPS than Warrior at full build. Ninja also has a bit of mana, which she'll appreciate due to partial reliance on abilities. Papps...build Ninja going crit, not Warrior. And a crit build at this point does NOT need Devo's either. Asi made that a thing. FYI, Trans, Ninja, Asi, Exe, WD, DB has even higher DPS than the Devo's build I mentioned above. Replace Ninja late with Poisoned Star and you've got a legitimate crit build, IF you really want to go that direction. 141314 Branmuffin17 Gulf, I would personally suggest keeping options open. If you look at the builds in your link, they're all over the place. [[Void Shield]] built 3rd, followed by [[Runeforged Hammer]]. Starting Rune, getting Trans 3rd, followed by O-Bow 4th. And then you look at other builds for other gods like Cern, and they're also all over the place. You dismissing [[Soul Eater]] because you didn't like it in Arena is honestly not a good reason, especially when considering it for a mode like Conquest. Arena, you don't need lifesteal nearly as much, as you know. In a longer mode, and when going Trans, your first option for lifesteal is going to be 3rd item after Boots. Typically we say not to get BF until late due to the price. [[Asi]] got a very nice buff, and the AS is great for that hybrid function, but the stats on SE aren't bad at all, depending on what you're looking for. If combining with Trans, the CDR from both is very nice, especially for a god that has pretty long CDs. The power is also pretty good, and it doesn't take long to stack. Again, if anything, it is probably niche and off-meta like I said, but just dismissing it, don't agree. [[The Crusher]] doesn't have to be built right after boots. It can be completely skipped at this point if you really want, due to the emergence of [[Asi]] and [[Ichaival]]. But if you DO get it, I agree with the build position. Crit should NOT specifically have Warrior over Ninja, dude. Skadi has no steroid. As an FYI, building Devo's, Ninja, Exe, WD, DB, and Ichaival, Ninja gives 25-30 higher DPS than Warrior at full build. Ninja also has a bit of mana, which she'll appreciate due to partial reliance on abilities. Papps...build Ninja going crit, not Warrior. And a crit build at this point does NOT need Devo's either. [[Asi]] made that a thing. FYI, Trans, Ninja, Asi, Exe, WD, DB has even higher DPS than the Devo's build I mentioned above. Replace Ninja late with [[Poisoned Star]] and you've got a legitimate crit build, IF you really want to go that direction. Bran, are crit builds with Trans + Asi really viable? Will the lifesteal from Asi be enough if the enemy team builds Nemean + Thorns? 141323 Vini_sds Bran, are crit builds with Trans + Asi really viable? Will the lifesteal from Asi be enough if the enemy team builds Nemean + Thorns? I think they're viable. All situations no, and they're expensive, but not all that much more than Qin's builds at this point. Asi Vs Nemean sure for the most part, but remember the ones that build it are never your main target. And against thorns? When would you ever want to keep attacking someone when they pop thorns? Even without crit, I see that activated I usually switch targets or back off unless they're really low health or multiple teammates are focusing. And see, Trans crit isn't for everyone anyway. I basically wouldnt build on Skadi. That comment was a general one. But I would consider for Medusa. She's always been viable with a trans build, and her quick burst from viper's steroid makes her a perfect candidate for crit. 141331 Branmuffin17 I think they're viable. All situations no, and they're expensive, but not all that much more than Qin's builds at this point. Asi Vs Nemean sure for the most part, but remember the ones that build it are never your main target. And against thorns? When would you ever want to keep attacking someone when they pop thorns? Even without crit, I see that activated I usually switch targets or back off unless they're really low health or multiple teammates are focusing. And see, Trans crit isn't for everyone anyway. I basically wouldnt build on Skadi. That comment was a general one. But I would consider for Medusa. She's always been viable with a trans build, and her quick burst from viper's steroid makes her a perfect candidate for crit. I'm still not sold on Soul and I think it needs to be tested before it can be considered outside of niche situations. 141321 Gulfwulf I'm still not sold on Soul and I think it needs to be tested before it can be considered outside of niche situations. Gulf, thank you for your feedback. Soul Eater compared to Asi, in terms of burst, is a clear winner. When fully stacked, provides triple the amount of power that Asi does, and heals you off of abilities. Remember that the point of a burst build is for most of your damage to be in your abilities, and building Asi defeats the purpose of building burst. I do agree, however, that The Crusher should be built before Soul Eater, as it provides a good spike to your power and overall damage, as the pen and attack speed work well together in all aspects of Skadi's character. I also did mention that if you are to sell Warrior Tabi for Elixir of Speed, to keep the replacement item within the build path, so building Runeforged Hammer is a great choice. Skadi needs Transcendence, as the power it gives is more than Devourer's Gauntlet, and is beneficial for her and other hunters of her kind like Neith and Ullr, who you would also build Transcendence on. Devourer's Gauntlet is reserved for hyper carries like Anhur, Artemis, and Rama, who's kits are built around their basics. It is also unwise to build crit earlier than The Executioner in such a build, as you need some attack speed in your belt to really make use of the critical damage. Will test out, as it seems promising and could yield nice results. Will also try out Warrior Tabi over Ninja Tabi in a crit build. However, The Crusher has no place in this build. And as I have already mentioned, Transcendence cannot be replaced, so you need the Asi for lifesteal, which means Ichaival/ Odysseus' Bow have no space to be in the build, unless as costly bridge items. The Tank-Shred build is the build you were talking about with Qin's Sais and attack speed. Remember that they are example builds, you can swap out the items with the other choices, like Bloodforge instead of Asi. Regarding Hide of the Nemean Lion, that is a good point, but I have not seen it built enough in recent times, as Midgardian Mail has become meta, due to reducing DPS instead of just reflecting the damage back. To your point about Soul Eater having not been built for almost two years now, notice that those are professional players, who after looking at the list myself, build in some unorthodox fashions, as they have mastered the game and Skadi, meanwhile this guide is meant more for players who are learning to play her. Professionals are not representatives of the overall census, even if lower level players in ranked do like to copy them as if they were. I suggest trying it in game, as I actually got the idea from a friend who dominates with the item in their build. I know I sound defensive, but with how you wrote some of your points, they pose to demerit the whole point of the guide: A beginner's guide to Skadi, her kit, how to build her in multiple ways/for multiple situations, and how to play her. I understand if you do not upvote my guide, and I am sorry if I offended you. 141313 IceColdPappsi Gulf, thank you for your feedback. [list=1][*][[Soul Eater]] compared to [[Asi]], in terms of burst, is a clear winner. When fully stacked, provides triple the amount of power that [[Asi]] does, and heals you off of abilities. Remember that the point of a burst build is for most of your damage to be in your abilities, and building [[Asi]] defeats the purpose of building burst. I do agree, however, that [[The Crusher]] should be built before [[Soul Eater]], as it provides a good spike to your power and overall damage, as the pen and attack speed work well together in all aspects of [[Skadi]]'s character. I also did mention that if you are to sell [[Warrior Tabi]] for [[Elixir of Speed]], to keep the replacement item within the build path, so building [[Runeforged Hammer]] is a great choice. [*][[Skadi]] needs [[Transcendence]], as the power it gives is more than [[Devourer's Gauntlet]], and is beneficial for her and other hunters of her kind like [[Neith]] and [[Ullr]], who you would also build [[Transcendence]] on. [[Devourer's Gauntlet]] is reserved for hyper carries like [[Anhur]], [[Artemis]], and [[Rama]], who's kits are built around their basics. It is also unwise to build crit earlier than [[The Executioner]] in such a build, as you need some attack speed in your belt to really make use of the critical damage. Will test out, as it seems promising and could yield nice results. Will also try out [[Warrior Tabi]] over [[Ninja Tabi]] in a crit build. However, [[The Crusher]] has no place in this build. And as I have already mentioned, [[Transcendence]] cannot be replaced, so you need the [[Asi]] for lifesteal, which means [[Ichaival]]/[[Odysseus' Bow]] have no space to be in the build, unless as costly bridge items. [*]The Tank-Shred build is the build you were talking about with [[Qin's Sais]] and attack speed. Remember that they are example builds, you can swap out the items with the other choices, like [[Bloodforge]] instead of [[Asi]]. Regarding [[Hide of the Nemean Lion]], that is a good point, but I have not seen it built enough in recent times, as [[Midgardian Mail]] has become meta, due to reducing DPS instead of just reflecting the damage back. [*]Will remove [[Blink Rune]]. [*]To your point about [[Soul Eater]] having not been built for almost two years now, notice that those are professional players, who after looking at the list myself, build in some unorthodox fashions, as they have mastered the game and [[Skadi]], meanwhile this guide is meant more for players who are learning to play her. Professionals are not representatives of the overall census, even if lower level players in ranked do like to copy them as if they were. I suggest trying it in game, as I actually got the idea from a friend who dominates with the item in their build. [/list] I know I sound defensive, but with how you wrote some of your points, they pose to demerit the whole point of the guide: A beginner's guide to [[Skadi]], her kit, how to build her in multiple ways/for multiple situations, and how to play her. I understand if you do not upvote my guide, and I am sorry if I offended you. I'm not offended, Pappsi. Now that I know your reasoning I'm comfortable giving you an up-vote. 141315 Gulfwulf I'm not offended, Pappsi. Now that I know your reasoning I'm comfortable giving you an up-vote. Bloodforge as an option is missing. Soul Eater is maybe an interesting off-meta option for the CDR and basic/ability lifesteal. Not sure if it needs to be listed here, was just a thought. Runeforged Hammer is now an option after the buff due to her high CC capabilities. It might work well in a burst build where you're using abilities a lot. You can even go Void Shield if you're having particular problems with physical enemies. For burst, Titan's Bane should be an option, even if you don't purchase it often. The Executioner and Asi don't have to be core every time, especially if you're going burst. Those are solid items for a crit or Qin's build, but you could go way different for a burst build. Even if it's clear that you're building Trans every time (due to your example builds and the presence of Morningstar in the starters, you don't have it listed at the top before Boots...probably should be there. A bit more spacing between topics/paragraphs might be nice aesthetically, but overall things do look nice. For the explanation on Kaldr, you might talk about how timing on his use is important, and remembering to call him back, or not send him out when there's a lot of ticking damage going on that will completely destroy his HP. Another thing is sending him in first to tank some tower hits to dive the tower or protect minions for a few extra seconds. You talk about Wind Demon being for when you find your DPS is lacking. However, Rage also helps your DPS. It's not about DPS so much as it is the AS and MS utility. Rage's higher crit chance gives the opportunity for greater burst up front. If you do invest into Jotunn's Wrath, you probably also want to invest in Titan's Bane, is my guess. You list Elixir of Speed, but don't mention elsewhere about replacing boots, and what to replace boots with in a given build. 141296 Branmuffin17 [list][*][[Bloodforge]] as an option is missing. [*][[Soul Eater]] is maybe an interesting off-meta option for the CDR and basic/ability lifesteal. Not sure if it needs to be listed here, was just a thought. [*][[Runeforged Hammer]] is now an option after the buff due to her high CC capabilities. It might work well in a burst build where you're using abilities a lot. [*]You can even go [[Void Shield]] if you're having particular problems with physical enemies. [*]For burst, [[Titan's Bane]] should be an option, even if you don't purchase it often. [*][[The Executioner]] and [[Asi]] don't have to be core every time, especially if you're going burst. Those are solid items for a crit or Qin's build, but you could go way different for a burst build. [*]Even if it's clear that you're building Trans every time (due to your example builds and the presence of Morningstar in the starters, you don't have it listed at the top before Boots...probably should be there. [*]A bit more spacing between topics/paragraphs might be nice aesthetically, but overall things do look nice. [*]For the explanation on Kaldr, you might talk about how timing on his use is important, and remembering to call him back, or not send him out when there's a lot of ticking damage going on that will completely destroy his HP. Another thing is sending him in first to tank some tower hits to dive the tower or protect minions for a few extra seconds. [*]You talk about [[Wind Demon]] being for when you find your DPS is lacking. However, [[Rage]] also helps your DPS. It's not about DPS so much as it is the AS and MS utility. [[Rage]]'s higher crit chance gives the opportunity for greater burst up front. [*]If you do invest into [[Jotunn's Wrath]], you probably also want to invest in [[Titan's Bane]], is my guess. [*]You list [[Elixir of Speed]], but don't mention elsewhere about replacing boots, and what to replace boots with in a given build. What's funny is that I like to be very general in my guides, but you had specifically stated that Asi and The Executioner were core items for any hunter build in the current meta. Due to this, there are no other lifesteal options like Bloodforge or Soul Eater, nor is there Titan's Bane, which messes up damage numbers when built with The Executioner. I have heard that Runeforged Hammer is a viable item for hunters with high CC, but have yet to test it myself. Could go in a burst build. Will fix the aesthetics and Talk more about the intricacies of Kaldr. When I mentioned DPS in the Wind Demon vs Rage, I meant that the higher power and attack speed that Wind Demon will increase your base DPS, while Rage is for overall DPS factoring in how often crits will occur with that item. Will fix to be clearer. I did mention Elixir of Speed and replacing boots in the boots notes, will make clearer.